New ‘Crimes of Grindelwald’ Trailer Unveiled at San Diego Comic Con! 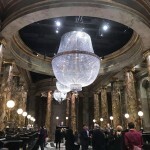 The moment Harry Potter and Fantastic Beasts fans have anxiously awaited has finally arrived–and Warner Bros. has delivered! Opening an epic theatrical panel featuring a full slate of highly-anticipated films, Fantastic Beasts: The Crimes of Grindewald mesmerized the Comic Con audience with a new full-length trailer after teasing this moment for weeks. 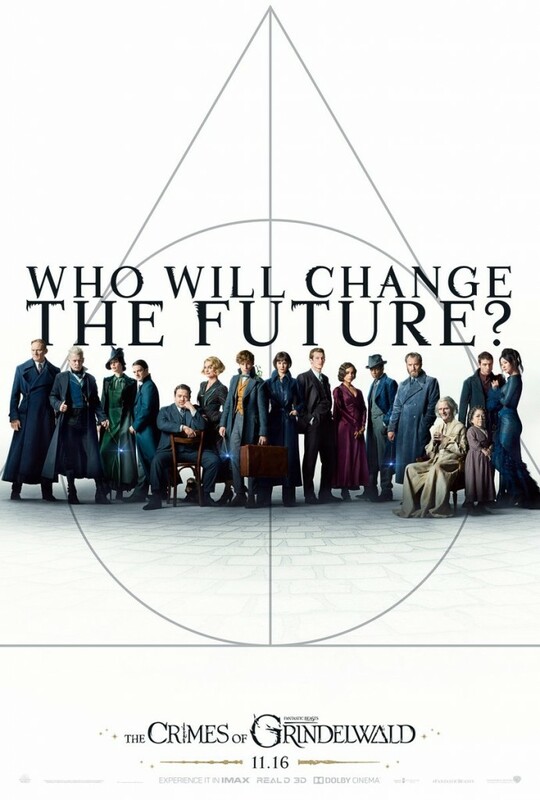 Yesterday a new promotional poster from Mina Lima was unveiled with the tagline: “THE FATE OF ONE WILL CHANGE THE FUTURE OF ALL.” The eerily prophetic statement was accompanied by images of the film’s main characters, symbolizing the loyalties in play. Leta Lestrange and Theseus. Newt, Tina and Jacob with Queenie, oddly and suspiciously, turned away. Credence Barebone and a Maledictus. Dumbledore opposite Grindelwald. Leaky analyzed the poster and raised the obvious question: whose allegiances will be tested–and who will fail that test in a way that impacts the entire wizarding world? Ahead of today’s panel, Entertainment Weekly also released new images of Newt Scamander and Leta Lestrange. 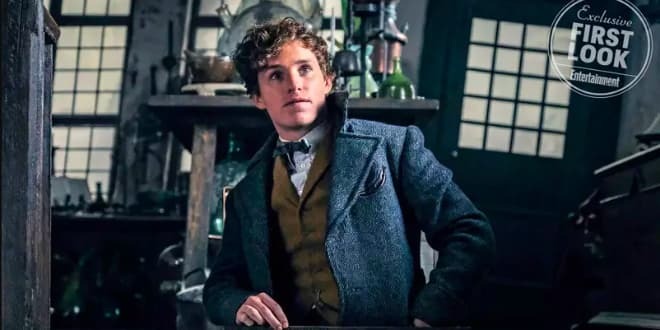 Leaky suggested that the first-look photo of Newt emerging from his case might be taking place in Nicolas Flamel’s workshop or laboratory. We already know Flamel will play an important role in the story, but how remains a mystery. 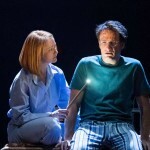 Leaky has speculated about his involvement before, and the official cover of J.K. Rowling’s screenplay also confirmed a focus on the alchemist, featuring a padlock inscribed with “NF,” a glass-domed covered object with striking similarities to the Philosopher’s Stone and a vial, presumably containing the famed Elixer of Life. With Grindewald exhausting all avenues for gaining and maintaining power, it makes sense he would leave no stone unturned, figuratively and literally. Leaky also theorized that the photo of Leta, which appeared to show her in a Hogwarts classroom, might be suggestive of her divided loyalties. Would she accompany Theseus on his mission to dissuade, or persuade, Dumbledore from or to a particular course of action? Would she seek an audience with him on an errand of her own design, which might relate to Grindelwald or to Newt? Aside from being a rising professor and an accomplished wizard, we’ve also learned from Jude Law’s recent Entertainment Weekly interview that Dumbledore is likely the resident Defense Against the Dark Arts teacher at Hogwarts during this time, which makes the Ministry’s appeal to him all the more reasonable. Bringing him in to consult on Grindelwald’s movements would serve a multitude of purposes…and makes us wonder yet again, why is he turning to Newt instead? Eddie Redmayne and Katherine Waterston also discussed the film in an interview with Buzzfeed, reiterating that the relationships between the main characters have changed, becoming far more complicated, and that the film is “much darker than the last one.” Ezra Miller, who recently spoke to Cinema Today, talked about Credence’s journey as well, confirming that the story only gets more complex for him as he experiences more external and internal conflict after realizing the magnitude of his powers. Credence doesn’t know who to trust. Given everything we’ve seen–does anyone? View the gripping new trailer below, and revisit Leaky’s analysis of the first official trailer here as well! Here’s a brand new poster, too… Who indeed? 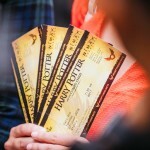 So, what do you think Potter fans? Does this shed further light on Rowling’s plans for our heroes or does it look, as hinted at by the cast, darker and more complicated than ever?